Please feel free to contact us anytime, Sandra and I both work regular jobs as well so leave a message on the email form below or on our home phone (answering machine). We would be more than happy to answer any questions you may have regarding our operation. We look forward to hearing from you in the near future. Weekend hunts: you are welcome to arrive on Thursday after 4:00pm. Midweek hunts: arrive after 4:00pm Sunday afternoon, unless otherwise instructed. 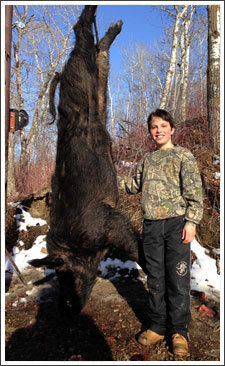 The Wild Boar hunting area is located straight east of our Redman Trophy Big Game Hunts location at the “crossroads”. We are 18 miles east of North Battleford, Sk. on Hwy 40 and 2 miles North on the Burma Road. Turn Right at the Wild Boar sign and drive 100yds to the steel gates. Click here for a Google map of our exact location or take a look at the map below.